This series of oil paintings highlights America's shifting identity in the decade following the 9/11 tragedies. 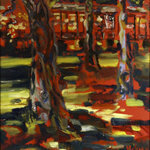 It began over ten years ago with her painting Red Day executed in oils the day after the tragedies. That expressionistic scene tells of the raw emotions of the time and started Melissa on an artistic journey over this last decade. 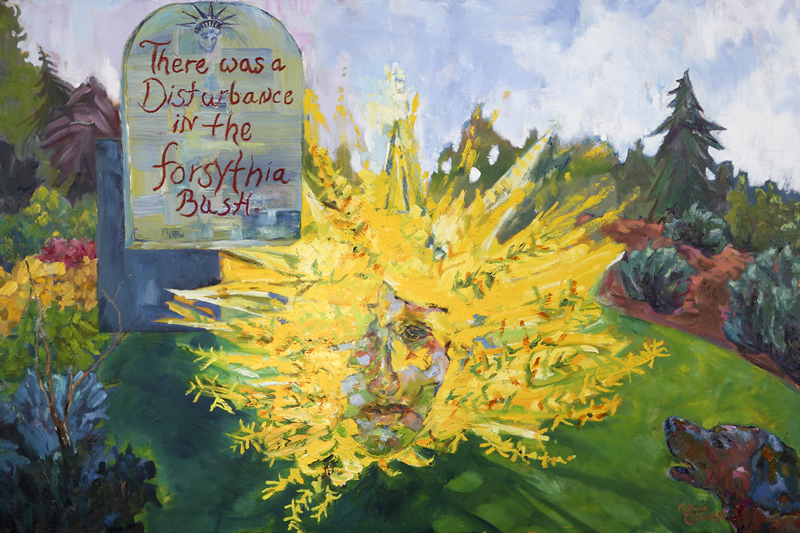 Beginning in 2010, she began new large canvases with arresting images. 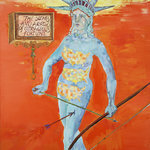 With sly visual wit, these pieces also tell a short history of our country, and yield an emotional wallop. 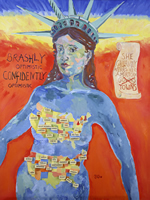 Croghan comments: The oil paintings in The Mother America Series offer a 21st century way to address the fears of post 9/11 years and to plug into the courage to move ahead. 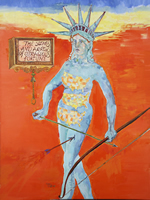 As a reflection of the inventiveness of the American people, I explore in these eight paintings the ways in which America reinvents herself in times of crises. 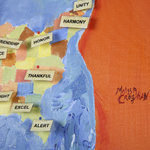 To create the strong figurative presence in The Mother America Series, my materials range from oil paint and pastel to map tacks, nails, laminated town names, and gold leaf. I draw my themes directly from life, using models and amplifying with imaginative drawings until I come up with just the right composition. 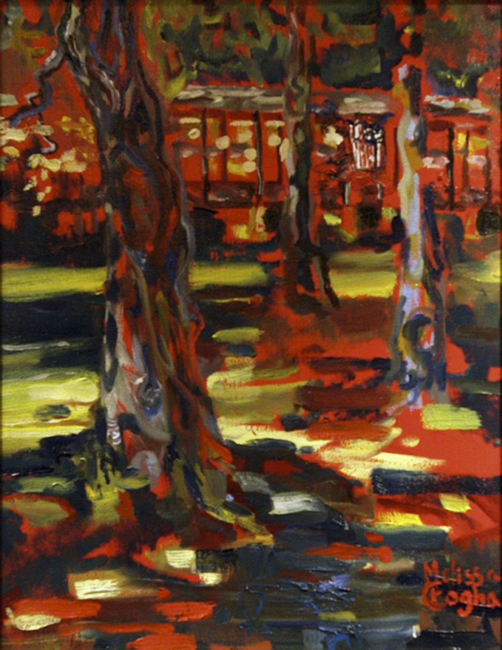 A Flock of Faiths Are We is the last painting in the series (thus far) and was completed in 2011. 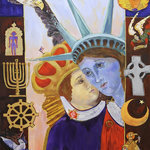 This painting began with my intensive study of an exhibit on faith and tolerance at the New York Public Library. 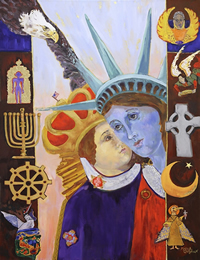 I wanted a painting highlighting Mother America and the fact that our nation was founded on principles of religious tolerance. 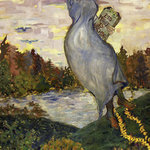 Oil paints and gold leaf in decorative relief are on view here. By Thanksgiving of 2001, we were still in shock over the 9/11tragedies. The model who posed for me was a New England farm woman with a stoic face. In this painting she represents how as a country we needed to combat fear by simply putting one foot in front of the other, gather in the harvest for our annual feast of Thanksgiving, and celebrate our strengths. 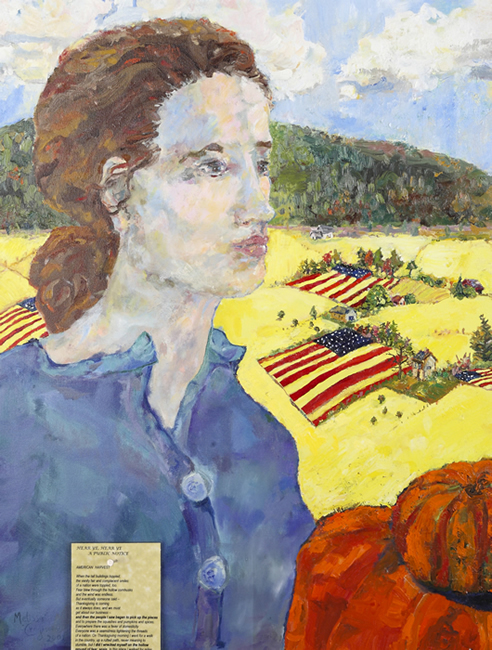 American Harvest is set against symbolic, interlocking fields of flags, with a call to courage tacked onto the figure’s shirt. This notice hammered into the canvas with a nail recalls colonial New England with its public notices hammered in the town square for all to see. 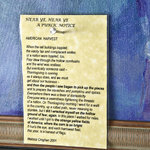 I often write poems that inspire a painting, and just as often it is the other way around, as in this case. 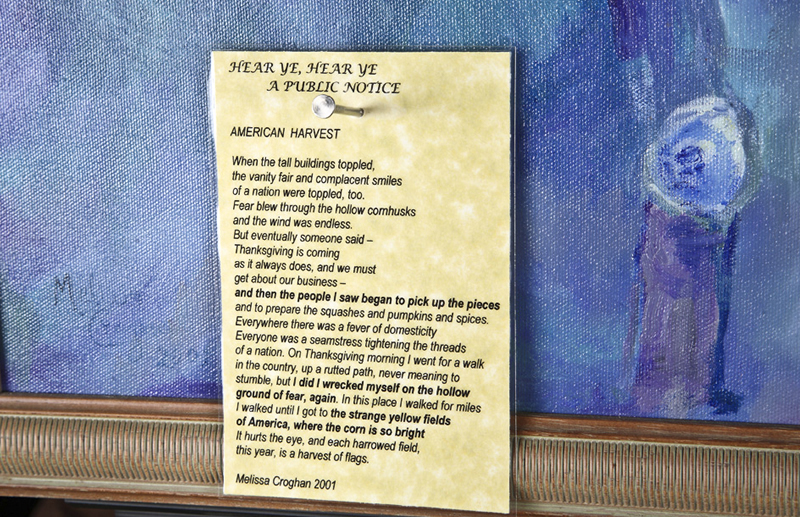 American Harvest, the poem came as a result of my deeply felt conviction of the meaning of the large oil painting of the same title. This poem documents the way art changes over time. 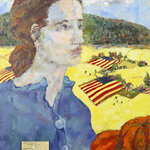 The symbolic images in American Harvest painted in the early spring of 2002 suggest a heartfelt patriotism: By the time the Iraq War was well underway, there were many soldiers down, and the flags in the field suggested something different. 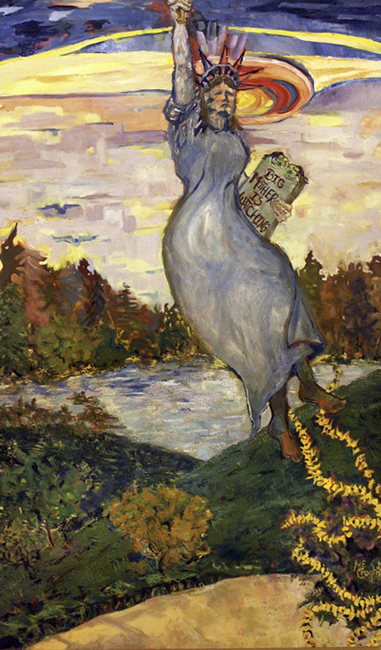 In a later painting and poem they represented burial flags. 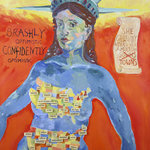 The comically inspired oil painting Optimistically Speaking reveals our lady once again, this time in a closer view and wearing strategically placed maps of the United States as clothing. 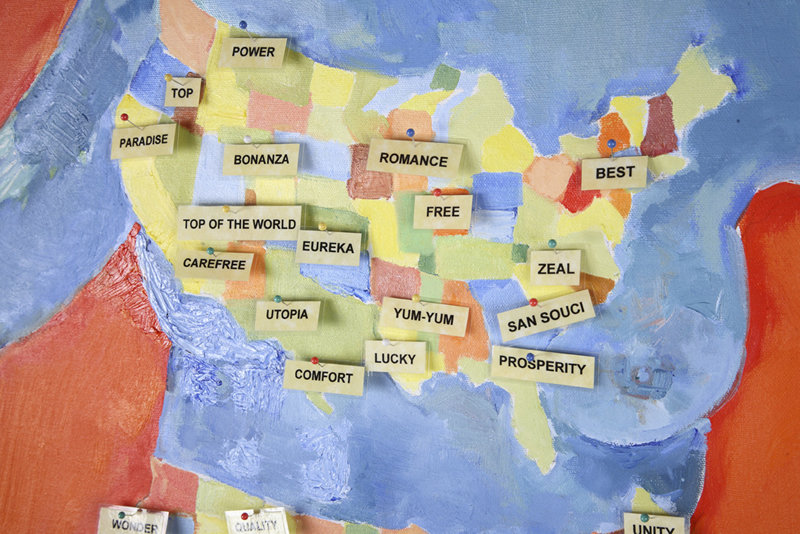 Picture, if you will, the map pins with real towns names of two kinds of American towns, the brashly optimistic versus the confidently optimistic places. One visitor to my gallery pointed out (rightly) that there was a good reason for giving towns brash names back in the pioneer days. We needed all the courage we could get. In many ways, the same thinking applies today. 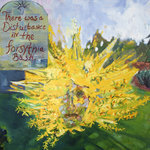 This humorous piece reveals Mother America hiding out in a forsythia bush, waiting to emerge. It is possible she has a few things to say to America, though she is taking her time about showing up. The dog in the corner of the garden has her figured out, or at the very least he’s got her scent and is barking up a storm. Each piece in my current body of work stands alone as a conversation piece, and yet also links to the next painting in the series. Thus, the Disturbance in the Forsythia Bush gives rise to Mother America in Up She Rises. And there she is flying up into the sky, wisps of that Forsythia bush showing below the pond. This time Mother America/Lady Liberty carries a tablet with a few words, words that I ended up changing once a month, on and off for years. 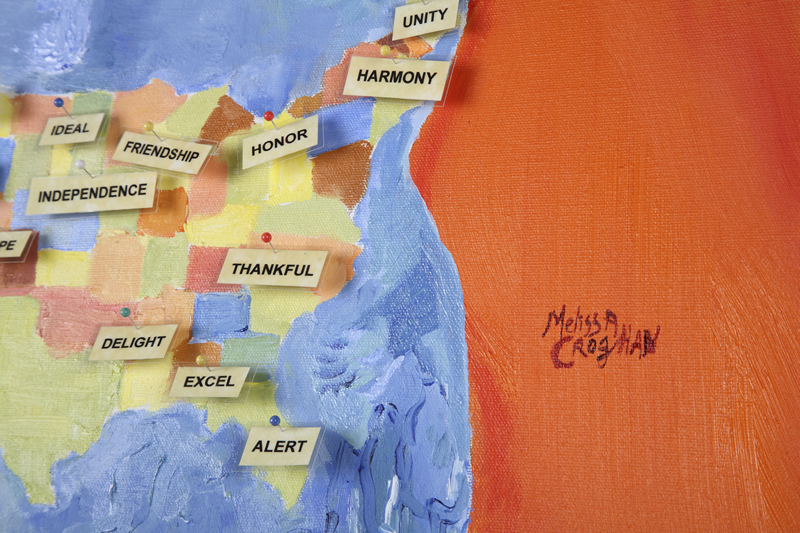 I found that in the months and years after 9/11, I could not stop re-painting the words on that tablet. This was not easy, as the words had to be covered over in the correct mix of teal and cadmium reds and yellows. Oil paints take a good while to dry, so I’d wait until that happened and then carefully paint in the new message. The most amazing part was that over time this painting became an interactive piece of art, with people arriving at my studio to offer up ideas of what the next words on the tablet Mother America carries should be. In time, I erected some blank canvases, our “wall,” and visitors wrote down their thoughts to Mother America. 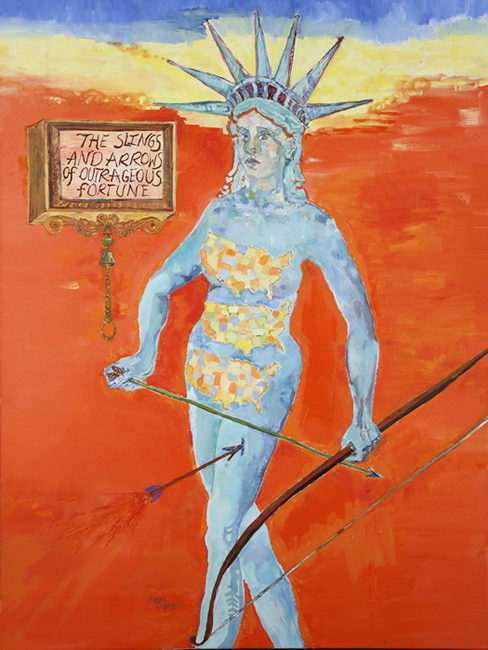 In Walking Wounded, inspired by the woodcuts in an exhibit on “Las Americas” at The Library of Congress in 2010, my painting depicts Mother America striding along with bow and arrow, battle scarred but still striving for humanity, a charged vision – one could say – of Americans today. I combine image with text, not to mention the crucial ingredient of wit, to meld my themes. 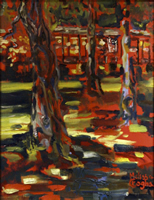 I was also lucky enough to do research for this painting in Munich last year. I studied the oil painting with themes on the confusion of war and egos in The Battle of Issus at the famous Pinakothek Museuem. It does not disappoint.